Are you a good judge of people? Maybe. We all feel we have some level of ability in this area. But job candidates are very good at disguising themselves -- hiding their weaknesses and exaggerating their strengths. It's called human nature. 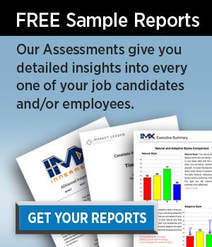 Assessments are most often used in the hiring process to review individual job candidates. But you can also use them with current employees to better understand their strengths and weaknesses - and be sure to give them responsibilities they can handle with success. Assessments are particularly helpful in team building where you are able to assign different responsibilities to different people. Assessments are important tools to be used in understanding your employees and job candidates. But in the end, the assessments produce statistical results. That's a good start, but it's not enough. What you also need is someone to interpret those numbers - someone who can give you real, practical insight into what those numbers are saying.